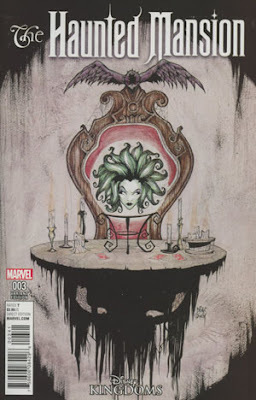 Haunted Mansion #3 helps to establish our villain’s motivations. As the story opens it becomes clear that the Captain is after one thing, treasure. The Captain has searched the mansion from almost top to bottom and cannot find this pirate booty. There is only one place he cannot go where it might be hidden, and he will need help to enter that area. Therefore he attempts to retrieve Danny from the endless party! But as the party finally ends a new character intercepts our mortal hero, the Hatbox Ghost. The Hatbox Ghost takes Danny on a spiritual and physical tour through the castle. And the abrupt ending of this tour results in hard truths for Danny. The other villain, Constance is depicted solely as motivated by murder! With Danny now facing the reality of his situation, will be become a victim to the Captain or Constance? Can he find the bravery he needs to move on in the Haunted Mansion? Joshua Williamson really seems to be writing this story for Haunted Mansion fans. And the inclusion of the Hatbox Ghost really works to prove my point. The Hatbox Ghost becomes a mentor, somewhat of the non-specific Yoda model. And he leaves us with more questions than answers. The big thrill for Mansion fans is the Hatbox Ghost’s and other denizens noting that Hatbox was gone but has just recently returned. 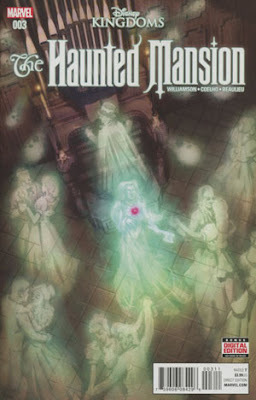 It feels like a literally tribute to the original appearance to this legendary ghost when the Mansion opened and his recent return. 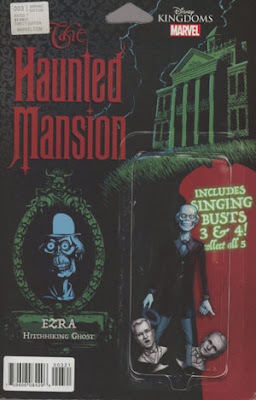 And Jorge Coehlo’s art continues to present the Mansion’s citizens in a familiar an non-scary way that the Between Kid can enjoy. 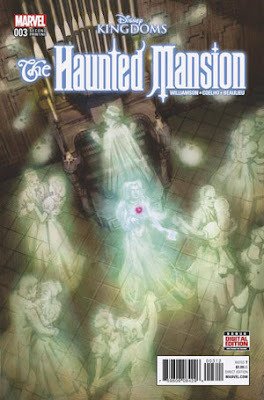 At this point I am seeing the Haunted Mansion Disney Kingdoms as a safe story. In fact safe is the word I used in my last review. It has a beloved Disney Parks attraction at its center. And the creative team is making sure to hit the fan needed notes to make sure fans are seeing what they most want with the Hatbox Ghost being a great example. And the story is not too scary, making it All-Ages friendly. Honestly, safe here may be another way to say success as while no one may be completely over the moon about the material but it is still something most readers can and will enjoy.